Over the last 30 years I have focused my research efforts on the coast and specifically on salt marshes and coastal lagoons. My doctorate is from the Boston University Marine Program in Woods Hole, MA, and as a graduate student I worked with a team studying effects of sewage sludge on salt marshes. We developed the first nitrogen budget for a salt marsh; I was especially interested in nitrogen fixation by blue green bacterial mats and also interactions between the main primary producers in this system – salt marsh grasses and algae. 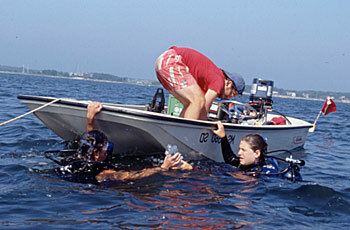 More recently I was a Principal Investigator on a National Science Foundation Land Margin Ecosystems Research investigation in Waquoit Bay, near Woods Hole. Since the 1950’s Cape Cod, like so many coastal environments, has experienced a very rapid population increase. As a result many bays (coastal lagoons) have undergone a phenomenon called eutrophication. Nitrogen, primarily from septic systems, but also from acid raid and fertilizers, flows into estuaries and stimulates growth of algae. Waquoit Bay used to support a scallop fishery but now the eelgrass beds that were home to scallops and many other animals has disapeared and has been replaced by thick mats of seaweed. I worked on oxygen dynamics in Waquoit Bay documenting, for example, fish kills caused by anoxic events. D’Avanzo, C. and J.N. Kremer. 1994. Diel oxygen dynamics and anoxia in Waquoit Bay, a eutrophic embayment on Cape Cod, MA. Estuaries 17:131-139. D’Avanzo, C. J.N. Kremer and S. Wainright. 1996. Ecosystem metabolism in response to eutrophication in shallow temperate estuaries. Marine Ecology Progress Series 141:263-274.